A section of University of Guyana students at a meeting called by their society to discuss the increase in administrative fees. 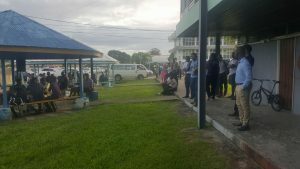 The University of Guyana Students’ Society (UGSS) Tuesday afternoon announced that it would be taking the university’s administration to court to challenge the legality of increasing administrative fees. The announcement was made by UGSS President, Norwell Hinds during a meeting with students over what their organisation said is the unilateral increase of the fees for 2018. He dismissed the UG administration’s position that the increase approved by Council, the institution’s highest decision-making body, in 2017 is also applicable to 2018. “Our interpretation is that the action to implement the fees requires the approval of the Council,” he said. “Our position is that the approval for 2017 was part of budget estimates for 2017. Until you present the budget for 2018, as approved by the Council, there is no locus standi,” he later told Demerara Waves Online News. UG has said that fees for processing applications for degree, diploma and certificate programmes have been increased from GY$500 to GY$1000, and late applications increased from GY$2,000 to GY $3,000), late registration hiked from GY$10,000 to GY$12,000, supplemental examinations moved from GY$1,500 to GY$5,000 and the cost of personal transcripts will move from GY$3,000 to GY$5,000. Some services were entirely free, and now attract a fee. They are re-sit examinations, which now cost GY$6,000 and letters for students that are used for visa applications and other purposes that will now attract a charge of GY$5,000. The UG administration sought to calm the student community that not all students would have to pay the fees. “Importantly, these fees are only payable if use is made of the services to which they relate. Thus, the new administrative fees do not affect all students. Indeed, some fees do not affect current students; they affect graduates seeking transcripts and other services. A significant proportion of the request for transcripts comes from graduates residing abroad, and dispatching those transcripts carries additional costs,” the publicly funded tertiary institution said. After meeting with students, Hinds said since the life of the last Council expired on July 12, 2017 a new body has not been appointed by the government. Against that background, the UGSS President said the institution’s decision to increase the fees in the absence of Council appeared unlawful. “The Council has not been constituted and that is the basis for our belief that it has to go the Court,” Hinds said. The UGSS President could not say immediately when the case would be filed by the association’s lawyers. UG, in a statement earlier this week, said the Finance and General Purposes Committee, a statutory arm of the Council, decided on June 1, 2017 to increase the fees. “The new administrative fees were approved by the F&GPC last year with the understanding that they would be instituted during the 2017-2018 academic year,” UG said. While several students, during the meeting, called for aggressive action such as protests, Hinds said all other methods have been tried before and now would be the first time that the Student body would be taking the administration to court. “I am saying that we can demonstrate that we can use different ways to ‘skin a cat’ (achieve one’s objective) and that our way is the way that will stand; it will stand for this executive, it will stand for the next executive and we have to show that we can demonstrate that the UGSS is thinking people, not emotional people only,” he said. Acknowledging that students “feel hurt” in different ways by the increased administrative fees, he said the UGSS would stand in solidarity with whatever actions students take because “we recognise that students will feel the burden differently”. “Any student can take whatever action they feel is necessary to demonstrate how the burden affects them,” he said, adding that the UGSS was not required to endorse protest. Less than 200 students attended Tuesday’s meeting that was held at the benab just outside the canteen.